where au is the angle between the N.A. and the principal U axis. ^ E.J. Hearn, Mechanics of Materials /, Butterworth-Heinemann, 1997. 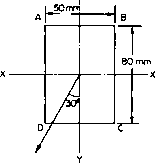 A rectangular-section beam 80 mm x 50 mm is arranged as a cantilever 1.3 m long and loaded at its free end with a load of 5 kN inclined at an angle of 30° to the vertical as shown in Fig. 1.13. Determine the position and magnitude of the greatest tensile stress in the section. What will be the vertical deflection at the end? E = 210 GN/m2. In the case of symmetrical sections such as this, subjected to skew loading, a solution is obtained by resolving the load into its components parallel to the two major axes and applying the bending theory simultaneously to both axes, i.e. = 105.5 MN/m tensile on AB and compressive on DC. 97.5 MN/m tensile on BC and compressive on AD. The maximum tensile stress will therefore occur at point B where the two tensile stresses add, i.e. 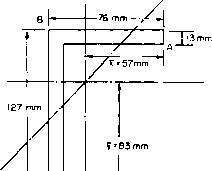 A cantilever of length 1.2 m and of the cross section shown in Fig. 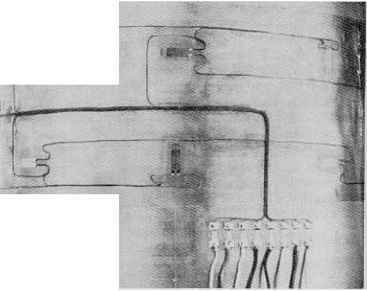 1.14 carries a vertical load of 10 kN at its outer end, the line of action being parallel with the longer leg and arranged to pass through the shear centre of the section (i.e. there is no twisting of the section, see §7.5^). Working from first principles, find the stress set up in the section at points A, B and C, given that the centroid is located as shown. Determine also the angle of inclination of the N.A.